Last month, I mentioned that Google Image Search is about to add some options that let you filter images licensed using Creative Commons. The options have been added to the advanced search page, where you can choose between images that you are allowed to reuse, images that can be modified or used commercially. Google Image Search is the first important image search engine that has this feature, since Yahoo Image Search only supports Flickr images. If you want to illustrate your web pages or your documents with images from the web, choose one of the four filters from the advanced search page, find the licensing terms and try to respect them. Anonymous that´s only accessible on google.com not on local domains. Sounds great - where does the information used in the filter come from? Does it have to be within the file? Is this standardized? That's an excellent question. Apparently, you need to use RDF code in your web pages and that's the reason why the images posted on this blog aren't included when you select a CC license in Google Image Search. 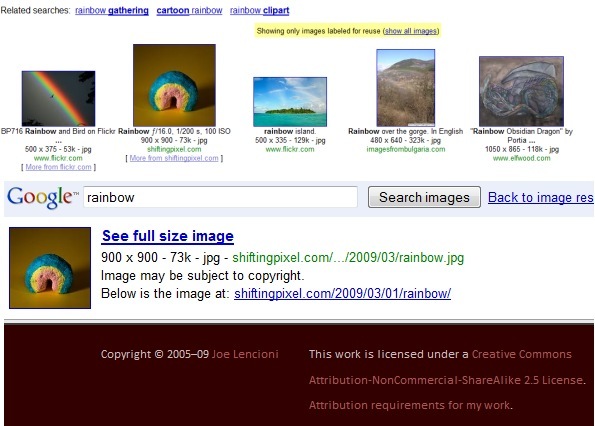 The Creative Commons filter from Google web search only requires a link to a license marked using rel="license". Shouldn't it try and automatically recognize phrases such as "This work is licensed under a _________ licence" such as that shown in the screen shot? "This work is licensed under a Creative Commons license"
Maybe in the next iteration. But even using RDFs can give you mistakes. If you really want to follow the law, you need to double check the images yourself. Creative Commons has had a search for a while which is fantastic!